There’s a great recent picture of Chet here, links to some other tributes here. 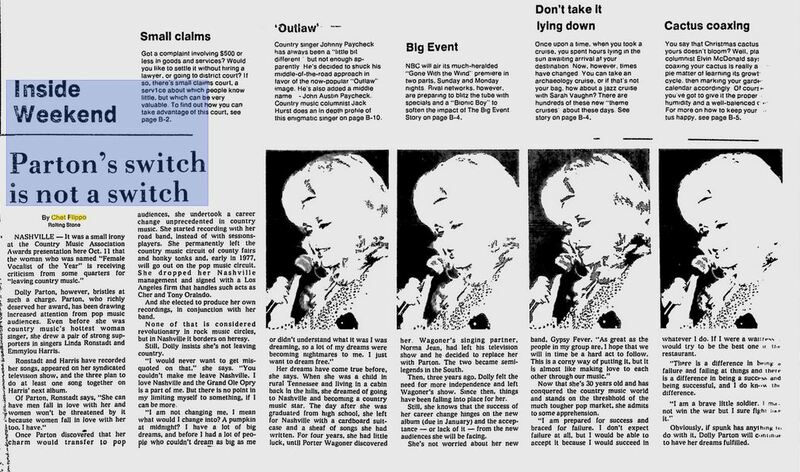 Also, an interesting 1976 piece on Dolly Parton from the archives. Chester (Chet) Flippo, “Rock Journalism and Rolling Stone,” Master’s Thesis, School of Journalism,. University of Texas-Austin, 1974. Michael, is this available online? Don’t see a link with your comment, and nothing via Google that I can see. I’d like to read it, though. “The History of Rolling Stone: Part I,” Popular Music and Society 3, 4 (1974): 159-188. “The History of Rolling Stone: Part III,” Popular Music and Society 3, 4 (1974): 281-98.